There is something special about going to my nail shop. I always have a great experience because either I am paying for someone, praying for someone, or someone is paying or ministering to me. I probably have written three blogs about my encounter in the nail shop. Well, this time was no different than any other time. I gathered my things to leave home with three other people. One happened to be a beautiful little eight-year-old girl that wanted to spend the day with me. We sit down to get our pedicures first and then we headed over to get our nails all beautified. I asked for my total, and the nail tech says, “You don’t have to pay for her. I will.” Tears started to form in my eyes because I saw something I have never witnessed from that side. I have been going to the same shop for fifteen years, and this was the owner who says keep your money. Now that was truly a great thing to witness but what got me is when Holy Spirit started to minister to me. He began to show me how the dots were connected. “Look your heart was just to spend time with her and then you wanted to be a blessing to her in your heart, so you went to do so…” I was waiting for Him to finish like “annnd…” Then, He goes on to say, “All I have asked any of my children is to purpose in their heart first. If they would just desire in their heart to be a blessing to others I will provide.” This was super good to me because I know many people take themselves out of the game before they get in the game. God has blessed us to be a blessing, and if we are just willing to be a blessing, He is obligated to give us what we need for others. Her not charging me taught me a big lesson that day. It doesn’t always have to come out of your pocket to help others. Let me inspire you today to just purpose in your heart to be a blessing to others and watch how God will provide. Stop looking at what you have in your hand and look at what’s in your heart. Whatever you give your attention to it will grow. It doesn’t have to be much to bless someone; it could be lunch or gas money. Whatever the amount or size of the seed just be willing to be a blessing to others and watch how God will provide. I love you, my sister! It is so true that gestures don’t have to be grand. Yes, God speaks in Mighty words and Mighty deeds, but He also whispers in our hearts. You continue to be a blessing to so many…I love you too! Thank you Dr.deedee for your awsome messages and examples..
Good Morning Dr. Dee Dee…..boy did this minister to my heart and soul this morning! I am always looking for ways to be a blessing, sometimes with gifts but mostly with my time. I must learn to not diminish my gifts with the thoughts that they are not enough, enough for who? I must learn to listen to the Holy Spirit when I’m told, well done, you are allowing me to guide you my child, you are allowing me to reveal all that is yours, but simply being obedient. I saw the pictures of you and that beautiful angel this weekend. May God continue to bless you immensely! Love you much! I’ve been giving a singl mother a ride during job training and someone asked me why doesn’t she pay? I simply said…. we’re going the same to the place why should she? Anyway, this is definitely #confirmation I am on the right track!!! Love you Dr. Dee Dee! Sweet story! This is a great example of how God honors our heart’s desire to be a blessing. Thank you for sharing! Wow! 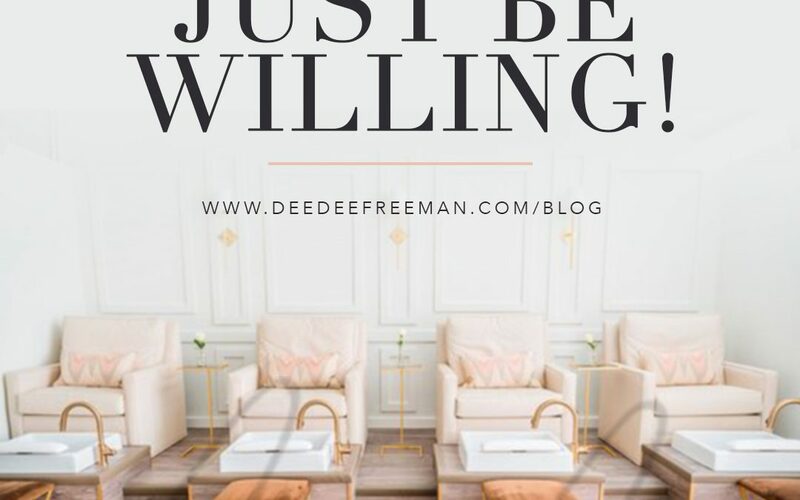 This post was such a Blessing Dr. Deedee! One of the things that I have had on my heart is to foster/adopt another child. We have already adopted one, but I remember the Blessing that it has been to be parents to a child who needed a “forever” home, and “forever parents.” Adopting one more will give us a total of six; four by birth, and two by adoption. I always say that our hearts are open to doing this because we are Blessed to be a Blessing. Thank you for this awesome reminder! I love this and it’s just why God showed me my purpose of helping teen, single moms and military widow families through a nonprofit that I use my own money. It was purposed in my heart decades ago, I had my child at 17yrs old yet beat all odds. Now I give free to those that need, often going without myself. Amen!! Sometimes I’m surprised at the simple things we can do to be a blessing to others. It maybe simple to us but “grand” to the receiver. Thank you for the powerful nuggets to enrich our lives. Thank you for sharing this word and experience. I truly believe and i am always sharing or giving to somebody. God is blessing me with great kids all teens and i have no complaints i love God and i love them. Thanks Dr. DeeDee for this awesome message. I Love you so much, Praise God for you! Thank you for always sharing your stories with us Dr. Dee Dee! This is confirmation that I am on the right track. My desire for being blessed is to be a BLESSING to others!!! Much Love!! AMAZING!!! I preached that yesterday how when God tells you to Bless someone be obedient and he will Bless you oh to be more like Jesus!!! Thank you (mother) / sister in CHRIST for the teaching and ministering to our ❤️ and souls. I will be a blessing to someone today! Wooooohoooo! I’m excited. Thank you Dr Dee! You talking directly at me Dr. Dee Dee! I used to complain (when I was younger)​ that I always gave my best creations [crafty] away and has nothing to show for myself. I would make beautiful item and give, give, give. I’ve since learned, in later years, that is the heart God wants us to have because he has an unending supply. I didn’t understand a giving heart back then [I was not only not in the Word, I was no where near it. lol IJBH]. Today I am pleased beyond measure. The devil tried to fool me into thinking I was in control of my wealth. Lier! Thank you Dr. Dee Dee for reminding us to be “others” minded. Preeeeeeeach! that was a good word! Awesome blog! Sometimes we tend to forget that we are blessed to be a blessing. Amen! Thanks for sharing Dr Dee Dee! Oh my goodness! Holy Spirit is awesome! My husband and I spent Mother’s Day with both of our children and their families. We ate lunch with my older son and his family, then we drove 100 miles to Columbus, Ohio to have dessert and spend the night with our youngest son and his family. We got up this morning and left their house to come back home to Cincinnati about 10:00 and on the road my husband and I prayed. After we prayed, while riding the rest of the way home, Holy Spirit ministered the same thing to me about 10:30 A.M. He said if you bless others by giving whom I lead you or just because you want to give, I will bless you and take care of you all the time. And He has proven himself time and time again. What confirmation on this matter. Your blogs are such a blessing and confirmation many times in my life. Thank you. Thank you Dr. DeeDee, I don’t have anything to add, just wanted you to know I appreciate you and everything you share…you are a blessing. I thank God for you. I had a blessed last year of growth in my company and I brought 10, $100 bills to service. At least 8 people were already on my heart to bless, and I did bless them. But one lady sat next to me in service and blessed me with a $5 offering-surprisr. Well, “I received” … and then God spoke as I watched her with a young child. I obeyed and gave her hundred dollar bill and she was speechless and we hugged ourselves into tears. I thank God for my desire to give!!! Amazing🌸💕🌺. Sometimes I get so caught up in day to day activities, we miss out on just being a blessing. THANKS FOR THE Encouraging words,will do more often. Good blog today as always thank you for being a blessing to us.. Awesome Word as always Dr. Dee Dee! We are blessed to be a blessing and we should have our blessing antenna’s up at all times. My husband challenged our congregation at the beginning of the year to give intentionally! Thanks for the reminder! I pray you had an awesome Mother’s Day! Thanks for all you to and for all that you impart. May God’s richest and best continue to be yours today and always! Love you. You are awesome. Good afternoon Dr. Dee Dee, I thank you for that message. It has opened up my eyes to remember that I do not have to bless others with money all the time. I must learn to listen to the Holy Spirit instead of listening to myself. I thank you. Many blessings always to you. Whew Dr. Dee Dee!! THIS right here was absolutely good to me… we just simply need to purpose in our hearts. You surely maximized that moment, thank you so much! Just this past Friday I got a phone call where I was servicing a client and come to find out she was a teacher for the youth ministry at her church. This was after I was going on and on with her about Gods goodness, living right and making sure our hearts are right. I must have stayed on this call at least 30 minutes past my time to get off work but the conversation was Sooo good. Not to mention the topic. The Heart! So powerful and so very important to our lives. In any situation the heart must be examined. How would He rest there? Yes, Dr. DeeDee, you were truly a blessing at the 8am service yesterday. I wanted so for my sister to go with me to GGG in July. We both just needed to wrap ourselves in The Word and get away from the world for a while. And, you offered to give away another registration for the Conference. I just knew in my heart that it was for my sister. Dr. Mike said 32210 and I knew the next numbers were 82. I was saying it when he said it and I yelled. I was so excited. I texted my sister and told her she was going and she said “WOW! GOD IS GOOD!!! I RECEIVE IT AND THANK YOU…WHAT A WONDERFUL AND TIMELY GIFT. YOU MADE MY DAY. Why? Because I was just beginning to “miss my Mommy” BIG TIME. Thx again. So, your blog was right on time. You blessed me and my sister and you were blessed in return. THANK YOU BIG TIME. This reminds us that small things matter. Love your simplicity in heart matters. Thank you! Just desire in my heart and He will provide. Thank God for the desire to have His heart to be a blessing. It’s a beautiful life in the Kingdom. Continue to hearken your heart to the will of God. This has blessed me tremendously. Wow! You definitely lead by example. This was beautiful! Thanks for sharing!!! Pastor Dee Dee, thank you for this Truth. God is so amazing how, He uses simple life issues to show us Him. My husband and I pray daily that God will continue to Bless so we can be a Blessing to others. We want to be Ambassadors for Christ Distribution Daily Representatives. I remember when I first heard of you and Pastor Mike, you all were in a supermarket buying groceries or thanksgiving dinner for people and that Blessed and inspired me so much to want to be able to do the same. I thank God for your Blogs, because I can always relate in some way. May God continue to richly Bless you in every area. I so appreciate how you share your Holy Ghost teachable moments, through them we indeed learn how to be more like Jesus! Thank you! Love you so much! This blessed me on this morning. Great revelation. This takes a load off of me. I want to bless others but I would beat myself up because I equated being a blessing to be monetary most of the time. This is liberating to me. Though I know that there are other ways to be a blessing, I haven’t always been in a position monetarily. However, it is my heart’s desire to be a blessing. Knowing that it is not based on what is in my hand is blessing me. It starts in my heart and “God provides” takes the weight off of my heart and thinking. Thank you for sharing and reminding us that giving to others experience God first hand. Good Morning and Thanks For Your Timing Word! Many want to be a blessing but is convicted because they don’t money to give, but as you stated it’s what’s in your heart. I will continue to be led by the Holy Spirit.